This Japanese-inspired dish is perfect with a bowl of rice and a miso soup on the side. 1. To make the yakitori sauce mix all the ingredients together in a small pan and bring to the boil, then reduce the heat and simmer for 10 minutes or so, or until the sauce has thickened to a glazing consistency. 2. Cut the chicken into 2.5cm cubes. Cut the spring onions into 2.5cm-long sticks. Place two pieces of chicken on the skewer followed by a spring onion baton, continue the same pattern, then finish the eight skewers. 3. Heat a barbecue to high, I like these done over charcoal if possible. Oil the bars of the grill and spread out the chicken skewers on it. Grill both sides of the chicken until the juices drip but don't overcook, then brush the sauce on the skewers and put back on the grill, and grill for 30 seconds on each side, repeating the glazing process twice more. 4. 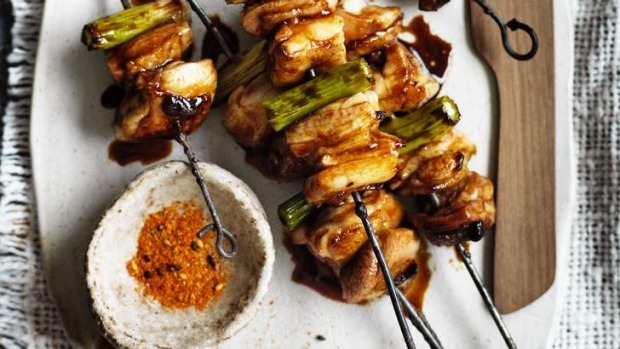 Place the skewers on plates and drizzle with the last of the glaze, sprinkle with shichimi togarashi (Japanese spice mix, available from Asian grocers) and serve with lemon wedges. The chicken thighs can be replaced with any part of the chicken you like: wings, for instance, would be fantastic. You could also do a mix of things like breast, wings, livers and hearts; this way of doing chicken offal is terrific. The sauce is also great with chicken stir-fried and finished with the glaze and some rice. A few of your favourite vegetables in it would be good, too. Shichimi togarashi is a Japanese spice mix of between seven and nine different things, each adding more complexity of flavour. You will generally find these ingredients in it: chilli flakes, sansho pepper, dried citrus peel, sesame seeds, poppy seeds, hemp seeds, ginger, garlic, shiso and nori. Buy some and you will be sprinkling it on all your barbecued food. If you buy a small Japanese barbecue and get some charcoal, I promise you will be cooking stick food all the time - it's a perfect way to eat healthily.